247 IT Assessment, Network Assessment - Bensalem, Philadelphia, Bristol | MTG, Inc. The average cost of IT-related downtime is $5600 per minute. How much time will you waste while risking potentially serious IT problems? 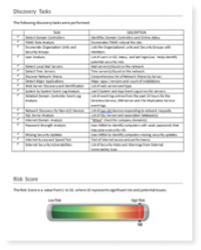 Detailed network assessments with no agents & no installs. Uncover email issues, facilitate migrations, automate on-boarding. Prevent payment fraud and protect sensitive data by complying with PCI standards. As a leading provider of IT services, we would like to meet with your team and provide a health assessment of your computer network and business technology. We will analyze your network to identify vulnerabilities that could leave your organization at risk of a business interruption and being out of compliance. Depending on what we uncover, we will also make suggestions on ways to prevent unauthorized access, augment security systems, better lock down sensitive data, become more mobile and, in general, get more out of your existing technology infrastructure. Note: For an assessment to occur, MTG IT Professionals must be given credentials to access your organization's network. MTG will not share any company data with third-parties nor will we store data from your assessment for use other than analysis. There is no obligation to purchase anything further with MTG once an IT Assessment has been completed. Get Your IT Assessment Here!